This solar shed is the result of collaboration between the Unity-based Backyard Buildings LLC. and the Pittsfield-based Insource Renewables. AUGUSTA, Maine — Gov. Paul LePage surprised virtually no one Monday afternoon when he vetoed a bill watering down solar policy rules that advocates say would slow solar power development in Maine. The bill, LD 1504, would have directed regulators to return to the drawing board and take the lead on a long-term solar energy policy for the state. In the short term, it would have prohibited new rules requiring utilities to install a second power meter at homes with renewable energy collectors that receive credits for power they put back onto the grid. The practice, called “net metering,” is dominated by small solar power installations. The bill also increased the number of customers who can take a shared interest in a generation facility, to 100, a change solar advocates and environmental groups cheered. Current law caps participation in community solar farms at 10 customers. The bill would not change how those new rules gradually decrease incentives for small solar providers under the current net metering policy. 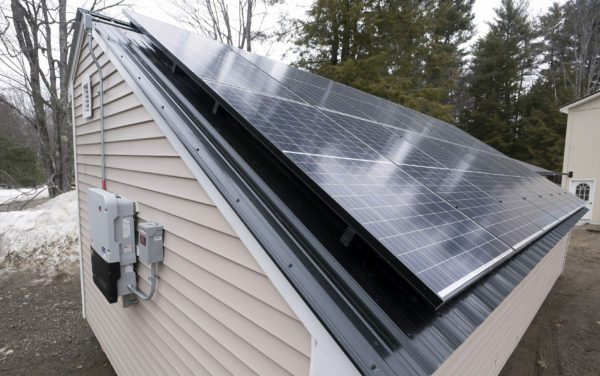 The bill would give policymakers more time to figure out the future of net metering, a concept that has been and will continue to be under debate at the Maine Public Utilities Commission. The bill calls on the PUC to develop recommendations to end net metering by 2019. In his veto letter, LePage struck a familiar refrain when it comes to his objections to solar power. LD 1504 garnered enough support in the Legislature to withstand LePage’s vetoes, if those votes hold. It passed 105-41 in the House and 29-6 in the Senate. However, veto-proof majorities on enactment votes have not always been safe in the past when it comes to bills that deal with solar. On the final day of the 2016 legislative session, a number of Republicans in the House of Representatives switched earlier votes and sustained LePage’s veto. The governor also wrote that the bill has “drafting errors” he said would lead to net energy billing customers getting credits even when they generate no electricity.